From the ArmyTimes.com. Click Here to view article online and see additional photos. Left to right: Augusta Mayor Hardie Davis Jr.; Maj. Gen. John B. Morrison Jr., commander of the Army Cyber Center of Excellence and Fort Gordon; U.S. Army Cyber Command and Second Army Command Sgt. Maj. William G. Bruns; Secretary of the Army .Eric K. Fanning; Lt. Gen. Paul M. Nakasone, commander of U.S. Army Cyber Command and Second Army; Lt. Gen. Todd T. Semonite, .Chief of Engineers and commander of the U.S. Army Corps of Engineers; and John Garlington, president of B.L. Harbert .International, turn the first shovelfuls of earth in a ceremonial groundbreaking marking the start of construction on the Army Cyber Command Complex at Fort Gordon, Ga., Nov. 29, 2016. 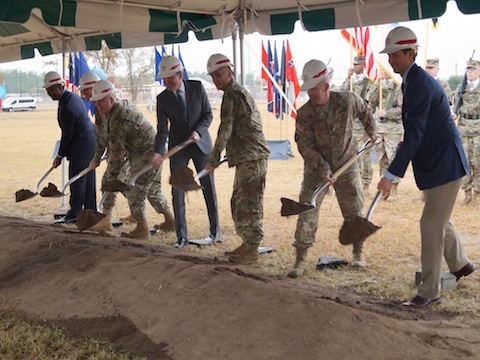 The groundbreaking for Army Cyber Command’s new complex at Fort Gordon, Georgia, represents a crucial turning point for the nation’s ability to fight in the cyber domain and diminish gaps in capability, Army leaders said Tuesday at the event. The new 300,000-square-foot facility, estimated to cost $180 million, will be a single hub for Army cyber organizations, which are now spread among nine locations across the service, Fanning said. As a result, more than half of the Army’s cyber mission team will be located at Fort Gordon, he said. The next headquarters of Army Cyber Command, expected to be occupied by 2020, will provide “the weapons system that will ensure our cyber warriors go into battle with the tools they need, so all of our soldiers can operate in a more secure environment,” Fanning said. Locating cyber organizations together will enable the Army to quickly adapt and train its cyber soldiers and civilians. Training of cyber warriors is already underway at Fort Gordon, Morrison said. Recently the first class of has graduated from the cyber basic officer leadership course, with 21 new officers for the Army’s cyber branch. Between now and the completion of the center, the Army will strive to keep building capability, the leaders said. One key role for the facility is to be “an incubator of innovation, to be a key node of the Army’s modernization and a pillar of joint force cyber operations,” Fanning said. The facility will allow the opportunity to build bridges between the Army and other innovators so they can address emerging threats together, leaders say. It will bring together cyber expertise from military, industry, intelligence assets and academia. The cyber center will defend the interests of the nation as a whole, Fanning said. “We are demonstrating to the nation that we are committed to protecting commerce, communication and critical infrastructure that allows our nation to thrive,” he said. Army Cyber Command will train and employ thousands of soldiers and civilians who will use the persistent training environment for experimentation and innovation to maintain an advantage over adversaries, Nakasone said. Their efforts will be organized to support Army forces across all echelons, he said. It will be a total Army force, Nakasone said, with Army Reserve and Army National Guard cyber warriors fully integrated into Army cyberspace operations. The command intends to support cyber careers for soldiers and civilians with an adaptive talent management plan, rewarding initiative and aptitude, Nakasone said. The center will need a continuous and significant power supply to keep operations running. In mid-November, Army officials opened a 27-acre solar power array at Fort Gordon. The project is designed to supply the civilian power grid that Fort Gordon uses, and in the future to provide power directly to the post. The independent energy source will help ensure continuity of operations at the cyber center, Fanning said. The Army and the nation must be prepared for a wide range of contingencies – and enemies, he said. View the Cryptologic Bytes Archives via the Return to List link below.